This app is based on the excellent paper1 from the Piñeiro group at Santiago de Compostela in Langmuir. They also have an app that provides a much more sophisticated fitting process, found at the STAND page on their website. Those who want authoritative values for their system should use that app. The version here is intended for hands-on exploration of the basic ideas. The CMC and CMC Saturation apps both address key issues of what happens when you add surfactant to water up to somewhat above the CMC value. In this app we find that it is possible to do a very full analysis of the surface tension versus concentration plot and derive an important extra value, the micelle aggregation number, N.
All that is needed to characterise the whole system is to find the parameters K, Γm, k and N via fitting of the surface tension versus concentration curve. Unfortunately this is not a simple task. In the real app a sophisticated optimisation is used. Here we use human fitting, by sliding the four property sliders to get an adequate fit. Seven datasets from the original paper (inaccurate because I have converted them from graphs in the paper) are provided for you to explore. The reason for the row containing a CMC input and some "suggested value" outputs is discussed below. The free energy of micelle formation, Δμ0 is derived from as -RT/Nln(k) and is in kJ/mole. K (from your input ln(K)) is shown for convenience. The area per surfactant molecule is calculated as A=1/(Avogadro.Γm). Although the STAND paper shows that CMC can be derived via their methodology, CMC is not provided as an output as it is fairly obvious by inspection to a good-enough precision. Although fitting my slider is not perfect, it is very instructive. It builds up an intuition about which parameters affect which part of the curve. Clearly K and Γm dominate one part of the curve and k and N dominate the other, so you can quickly get to an approximate solution. Then, within the limitations of sliders, you can use your eyes and/or the RMS Error value to find a decent fit. The absorption coefficient, K, is input via ln(K) because it covers a wide range. The equilibrium coefficient is input as ln(k). If you take a typical value of 300 this means that k is e300 = 10130, a truly enormous number, but necessary because the other part of the equation is cfreeN which, for 10-6M and N=50 = 10-300. The surface tension for water is taken to be 71 mN/m as that is the value used/fitted by the original authors. For simplicity, the temperature is assumed to be 25°C. The original paper has data at other temperatures. Errors from fitting data taken at other temperatures will be small because RT changes by only 3% going from 20° to 30°. 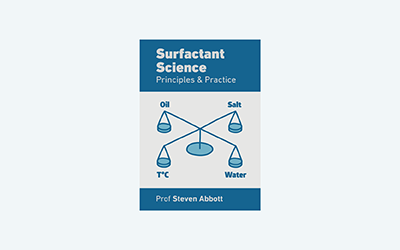 The authors state that their approach is (currently) only applicable to non-ionic surfactants. My (limited) understanding of the situation is that if an ionic surfactant is used with a "swamping" concentration of salt then the app can be used too. The authors' app lets you load your own data which can include 4 columns of data for their more sophisticated fitting, with a warning that just 2 columns will not be so accurate. For this app the file format just uses 2 data columns but with a format that is convenient for generalised reading. The first row simply says Item,Conc,gamma and subsequent rows say Data, followed by the concentration in mM and the surface tension in mN/m. In both cases you can use comma or tab separated variables. The app handles up to 20 pairs of datapoints. If you want to see my versions of the datasets, you can download them as STANDdata.zip. Note that the assumption that cfree = ctot is explicitly not part of the STAND approach and is introduced here as a useful approximation to arrive at plausible values to feed to the STAND model. Some simple checks are made to ensure that the entered CMC gives the fitting procedures a chance to create meaningful values, i.e. with a reasonable number of pre- and post-CMC data values, otherwise a "No solution" message appears in the relevant outputs. If you would like to enter the calculated values directly into the main slider inputs, click the Set Inputs button.